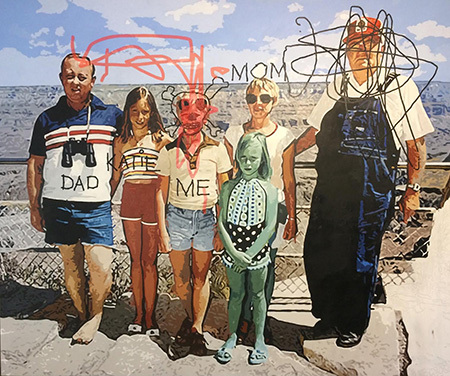 Colin Chillag, "Tourists 1," 2017, oil on canvas, 60 x 72"
Using primarily found photographs that conjure memories of his childhood, Phoenix artist Colin Chillag explores the imperfect, ever-changing landscape of human existence. The images provide incomplete images of particular moments, their subjects and surroundings painted only partially, amid marks that belie the process undertaken to give them life. We see underpainting, sketching, and artist notations throughout, prompting reflection on the philosophical notion that every person, place, thing or idea is in a perpetual state of flux. Whatever we think we’ve seen is no longer there, and what we’re witnessing is the creation of the next fleeting moment. It’s an endless stream of ontological do-overs. For “Tourists 2,” Chillag sets six people on an overlook of the Grand Canyon. The scene’s jagged borders are surrounded by a dirty white background covered in childlike scribbles and bits of blue and yellow paint. The people in it are taking photographs, poetically mocking the modern tendency to record moments of time rather than fully experience them as they transpire. These works, which are about the landscape of the artist’s mind, are visually jarring. In some works that’s because of what they include. Other times, it’s due to what’s been left out. Two of the larger works are based on group photographs of young classmates. In “It is Important to be Nobody” Chillag paints out the faces of several children, and blackens out details from a sign with classroom identifiers. He embellishes “Class Snuggle,” a group photo from the 1970s, with Jim Henson in place of the teacher, and also includes figures such as Yoko Ono and Charles Manson behind the kids. Chillag’s work is a deliberate, at times compelling counterpoint to a culture saturated in polished commercial images that promulgates a false narrative of endless, effortless perfection at its own peril.